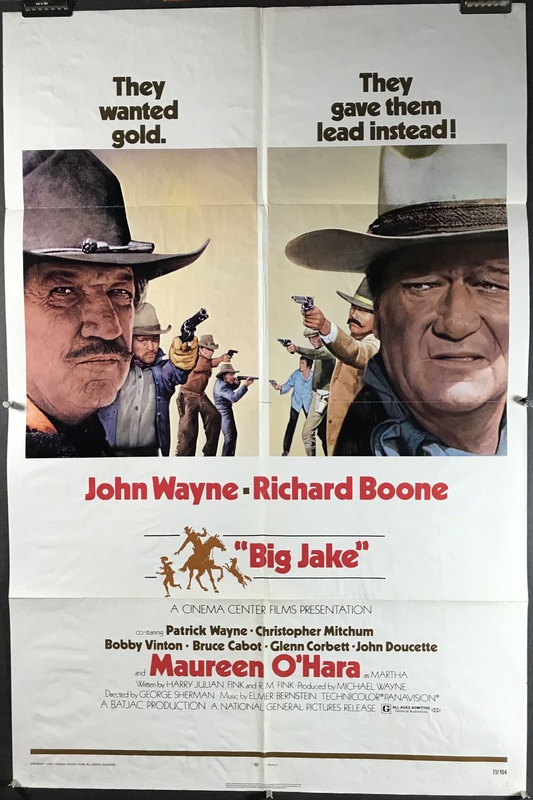 BIG JAKE, 1971. Original 1 Sheet (27 x 41” / 69 x 104 cm) folded movie poster starring John Wayne, Richard Boone and Maureen O’Hara. Directed by George Sherman, and produced by Michael Wayne, John Wayne’s eldest son. “They wanted gold, they gave them lead instead.” Simple storyline set in the Wild West about a kidnapping, ransom, and payback for the kidnappers by tough guy Wayne. This folded 1 sheet poster is in very good original C8 condition. There is some light wrinkling throughout the poster, and a small tear at the right-hand side of the middle horizontal fold line and at the apex of two middle fold lines, which could be taken care of during the linen backing process. Linen Backing is available for an additional $80 upon request or by adding the service to your cart below. This would produce a flat, backed poster that’s ready to display! We linen back and frame all of our posters IN HOUSE at our studio in Katy, TX!